Spy cameras disguised as penguins were used to capture these incredible pictures of the flightless birds’ private lives.�Documentary film-makers hid their cameras inside 50 animatronic replicas of the marine birds to get closer to them than has ever been possible before.�The were captured for a forthcoming documentary charting a year in the lives of three penguin communities, revealing the qualities that make them among nature’s most devoted parents. Penguins – Spy In The Huddle follows emperor penguins in Antarctica, rockhopper penguins on the Falkland Islands and Humboldt penguins in the Atacama Desert of Peru as they bring up their young.�The team behind the documentary, due for broadcast on the BBC, cunningly hid their cameras inside life-size, robot replicas of each of the species they looked at. 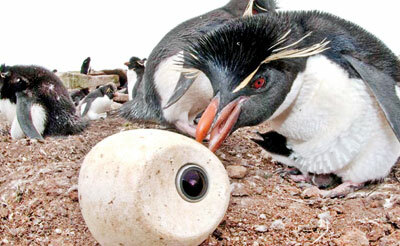 Each was even able to lay its own ‘egg-cam’ to film the action from a chick’s-eye view.�’Key to the success of the spycam missions are the animatronic cameras cleverly disguised as lifesize penguins which can silently infiltrate the colonies to record the penguins’ often emotional, and sometimes amusing, behaviour,’ the said documentary’s makers in a statement. The spy-cam penguins were on hand to watch as emperor penguins negotiate treacherous sea ice and 90mph blizzards; rockhoppers as they brave stormy seas; and Humboldts as they dodge Peruvian vampire bats. The animatronic penguins they used were so lifelike they even got attacked by predators and their eggs were even ‘adopted’ by other birds.�Others got into fights with rivals, including one which was beaten up by a jealous partner after it was courted by a rockhopper and another which had its legs broken when it was pushed off a cliff. The full-size penguincams can walk, get back up when knocked over, have cameras in their eyes and can even lay their own eggcams. The documentary was the work of French-Australian cameraman and scientist Frederique Olivier, 36, and her field assistant Martin Passingham, 42, who spent nearly a year in Antarctica collecting footage.�Ms Olivier is a scientist turned camera operator and photographer, while Mr Passingham worked as a helicopter pilot and heritage carpenter on Antarctic historical huts, and looked after everything from building huts to repairing the penguin robots. Setting out on foot and by ski from French Antarctic base Dumont D’Urville Station (DDU), Ms Olivier and Mr Passingham braved temperatures as low as -30C to chronicle the lives of emperor penguins.�Temperatures through the winter plummeted to -30C, with most days -20-25C for two or three months, with a wind chill factor which drops the effective temperature felt by a human down to -50 to -60C during strong wind events such as catabatics (up to 200km/hr) or blizzards (around 150km/hr). Blowing snow is a great way to try and kill cameras, the pair said – it gets in everywhere. Ms Olivier and Mr Passingham covered many more miles, within a 15km radius, exploring the frozen sea ice during winter in search of emperors. �Their only mode of transportation was on foot and ski, and they walked daily to the colony and also set up a small cabin nearer to the colony where they camped overnight half the time for the first three months. Totally isolated for eight months, they captured over 1,000 hours of footage of the birds’ most-intimate behaviour, including some which have never been filmed before including chick-napping by desperate, childless females and fights between penguin love-rivals.�DDU is one of the two French bases in Antarctica, located on the coast of Terre Adelie on the top of a small island called Ile des Petrels. During winter, the stable sea ice there is protected from the fierce winds and hosts an emperor colony of 3,500 pairs.�In the geophysics building back at the French station, they set up a portable edit suite and satellite link to upload footage throughout the year. The first episode of Penguins – Spy In The Huddle is set for broadcast tonight on BBC One at 9pm.